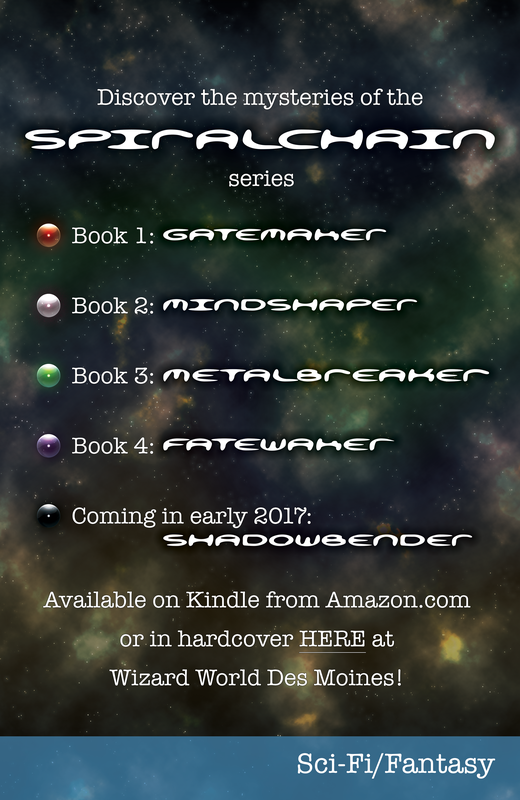 Spiralchain books will be available directly from the author at the 2016 Wizard World Des Moines comic book convention! Work on Book 5 begins in earnest this month, now that the outline has come together–and more news about the short story anthology (including a title!) is coming in June! Here’s the great poster that series artist Andrew J. Aguirre made for the show! Stop by booth C28 if you are at the convention and get any books from the series you are missing and an exclusive Spiralchain bookmark! This convention is also the debut of Jeremiah L. Schwennen’s new series, The Omnigenos Chronicles… which just may contain a few secrets of the Spiralchain!